What follows is my perspective of integration of common traditional western symbols, and the Chakras. 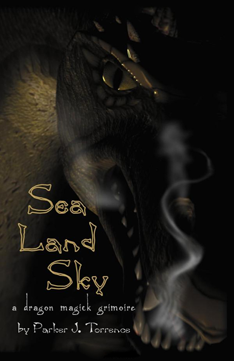 These MP3s are based upon text found in the book Sea Land Sky :: A Dragon Magick Grimoire. Files are for personal use only and can not be sold or distrubited in any format! Audio file copyright © 2005-. All Rights Reserved! One of the keys of using Dragon Magick is in understanding and unlocking your dragon chakras. Breathing is one key to unlocking the dragon chakras. When you breath, it needs to be from the diaphragm. You breath in through the nose and out through the mouth. Breathing is done in a rhythmic pattern. The first pattern you should learn to master is the 4-2-4-2 pattern. You breath out for four counts (heart beats) hold your breath for two counts, breath in for four counts and hold for two counts. Do not forcibly block the air flow, just learn to not inhale or exhale. Once you have mastered the 4-2-4-2 pattern, expand your abilities with the 6-3-6-3 pattern.